In this application note, several benchmark models are created and simulated in order to demonstrate WIPL-D Pro capabilities. 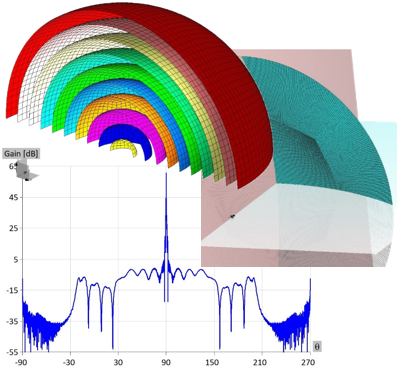 WIPL-D Pro is full wave 3D EM solver, based on Method-of-Moments (MoM) and empowered with quadrilateral mesh and higher-order basis functions (HOBFs). All the models should be considered as demonstrational models. It is expected that the output results and relatively short simulation times will be in the focus of the reader of this document. The examples include reflector antenna with parabolic dish, microstrip patch antenna, printed microstrip band pass filter, horn antenna, coil with ferrite core, dielectric rod antenna and dielectric rod antenna arrays. All simulations were carried out at regular desktop PC almost instantaneously. This application note represents an addition to the document Benchmark Examples (1). However, it can be read without previous reading of the previous material. Various benchmark examples are created and simulated in order to present WIPL-D Pro capabilities. It is expected that the output results and relatively short simulation times will be in the focus of the reader of this document. The examples include 12 m long fighter aircraft at 0.3 GHz, printed band pass filter, monopole antenna on a 30 m square plate at 300 MHz, ultra-wideband elliptical antenna, hemispherical dielectric antenna, hemispherical dielectric antenna Arrays, welder machine, aperture coupled waveguides. 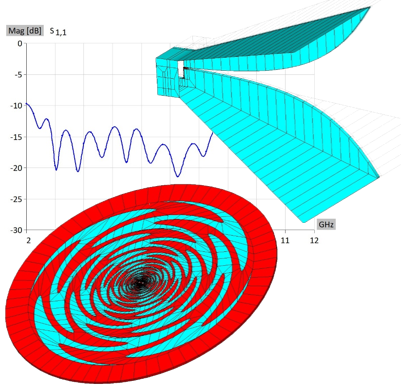 All examples are simulated on regular desktop PC in very short simulation time. This paper presents several benchmarks which were requested by Technical Committee on Electronics Simulation Technology (EST) of the Institute of Electronics, Information and Communication Engineers (IECE) in Japan. 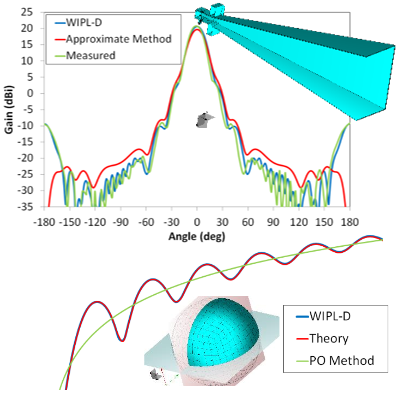 WIPL-D simulation results are compared with known solution so that we establish the accuracy of simulation. WIPL-D solution is compared either with analytical results, measured data or results from EM software modules which were also provided by EST tailored especially for the specific problem. The examples include: RCS from metallic/dielectric sphere, input impedance and gain of the dipole, microstrip line fed patch antenna, waveguide slot antenna return loss, standard gain horn, microstrip stub, microstrip capacitor. All models are simulated on a regular desktop PC with minimum requirements. 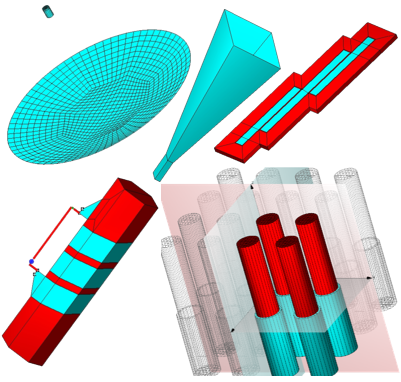 In order to show the efficient usage of hardware resources (CPU and GPU) during electromagnetic (EM) simulations in WIPL-D software, the overall simulation process should be explained. WIPL-D electromagnetic simulation contains two main phases: the matrix fill-in which is followed with the matrix inversion. For electrically small problems, where the MoM matrix has up to a few thousands of unknown coefficients (unknowns), the fill-in time is dominant. For electrically large problems, above 50,000 of unknowns, the matrix inversion time requires 80-90% of the total simulation time. The most important aspect of the matrix fill-in is to efficiently exploit the advantage of modern CPU hardware, which all have multi-core capabilities. In addition, WIPL-D GPU Solver is an add-on tool that efficiently exploits high computation power of nVIDIA CUDA™-enabled GPUs to significantly decrease EM simulation time. The acceleration is up to an order of magnitude for the matrix inversion phase. As an example, the total simulation time is decreased (by using multi-core CPU fill-in and multi-GPU matrix inversion) to less than one hour for a problem with 200,000 unknowns. The GPU Solver enables WIPL-D Pro to significantly decrease the simulation time, particularly for the dominant component – MoM Matrix inversion. This applies especially in the case of very complex and electrically large structures with dramatically large number of unknowns. In such cases, the suggested simulation approach is using GPUs to perform computing operations instead of CPU. Significant acceleration is demonstrated even for the problems with 50,000 – 150,000 unknowns compared to a CPU workstation with 2 CPUs, each with 12 cores. Such problems are within reach of the CPU solution, especially if there is enough available RAM. The app note shows the simulation times for an affordable workstation with 4 low-cost GPU cards and several hard discs supporting the GPU solver. All times are rather short and acceptable from the engineering point of view. If the system matrix is symmetrical, as in the cases of pure metallic structures, the reduced matrix inversion can be applied with significantly shortened simulation time. The two demo problems are Luneburg lens and the Cassegrein reflector antenna. 440 lambda Cassegrein, normally out of reach for any full wave solver, is solved in only 6 hours for the 500,000 MoM unknowns problem. The focus of the application note is set of examples where the advantages of MoM are theoretically minimal: ultra wide band, large number of frequency points and electrically small or moderate size structures (the number of unknowns is low, while size of elements prevents usage of HOBFs and the number of mesh elements is relatively high). The simulation times are compared for a modern quad core CPU versus a modest multi-core configuration with two affordable 12-cores CPUs Highly efficient parallelization of the matrix fill-in phase is done at both platforms. For the electrically large problems, the matrix inversion is usually the dominant phase. Adding even a single inexpensive GPU card to standard desktop is the optimum solution for speeding up the matrix inversion. An ideal workstation for WIPL-D simulations is a multi-thread CPU with even a single GPU card. 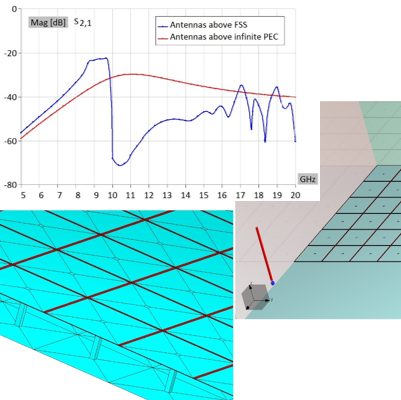 Using the modern configurations with 20+ cores improves the simulation times for UWB applications or electrically small antennas with many details dramatically. This extends the range of EM problems that can be solved by only using CPU with acceptable simulation times for EM and RF engineers. Radio-frequency identification (RFID) is one of the many electromagnetic (EM) applications where WIPL-D software suite is successfully used. 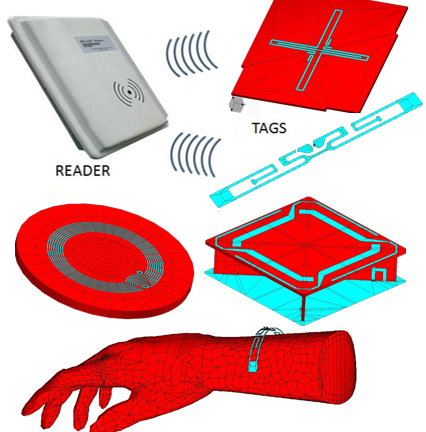 RFID assumes the wireless use of electromagnetic fields to transfer data, mostly for the purposes of automatic identification and tracking of various tags attached to target objects. WIPL-D Pro as a method of Moments based code is very suitable for RFID. Most of the small and less complex tags are simulated in a few seconds. 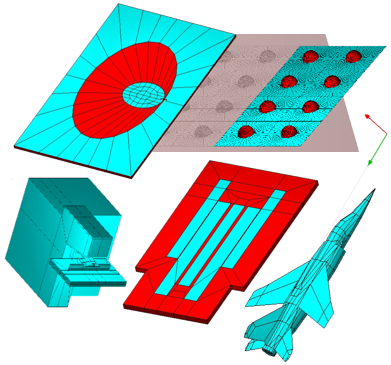 WIPL-D is extremely efficient for open radiating problems and especially for simulation of coupling between very distant objects (no boundary box requirement). WIPL-D Pro does not require to mesh the space between reader and the tag. Part of the applications of WIPL-D software for devices marked as RFID include common industrial RFID tag (even winded around human wrist), complex RFID Reader at 13.56 MHz, multiband cross spiral tag, quadrifilar spiral antenna with circular polarization for UHF mobile RFID reader. Due to inherent higher order basis functions, efficient parallelization on multi core CPUs and support for simulations on GPU platforms, WIPL-D software can be effectively used for radio frequency propagation problems. One such problem would be determining power transfer between transmitter and receiver antennas at radio frequency (RF) frequencies in under-ground tunnels of significant length (several hundreds of meters). The simulation setup involves positioning two antennas (transmitter and receiver) inside a very long tunnel. Usually walls are made of concrete, where characteristics vary: Er between 4 and 7 and Sigma between 0.02 and 0.0002. Tunnel height is 7.2 feet and width is 6 feet. 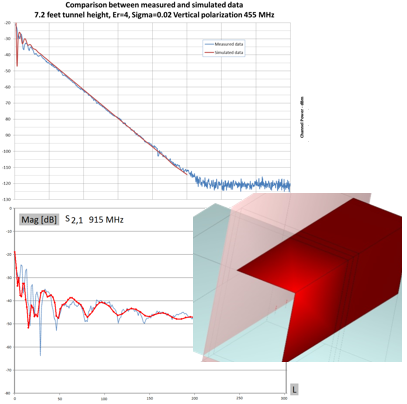 Simulation frequency of interest ar 455 and 915 MHz. The effects of using horizontal or vertical polarization are also discussed. 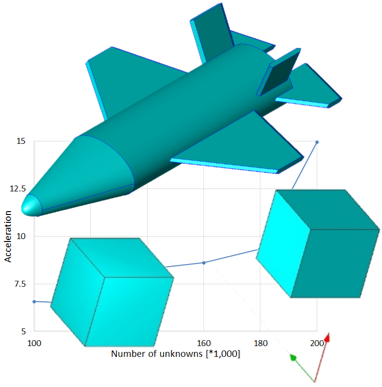 Simulations show comparison of measured and simulated data, where the distance between antennas is spanned between 0 and 500 feet, where simulation time is measured in hours.